Last weeks bounce higher in the spot gold price, was also reflected in the spot silver market which saw Friday’s price action push the industrial metal back above the $18 per ounce price handle once again, and closing the silver trading week marginally above the 9 day moving average as a result. 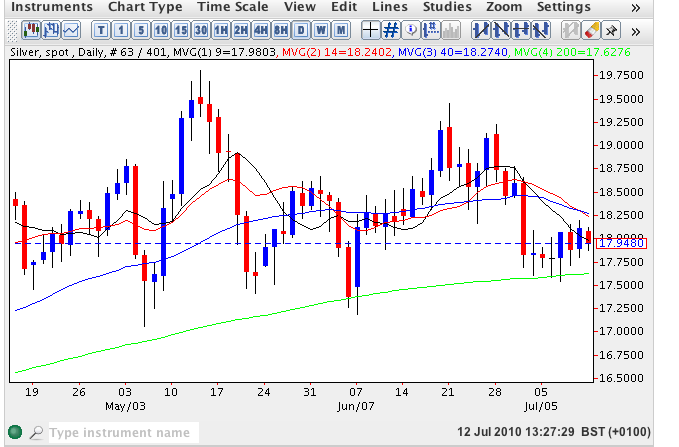 The price action for spot silver last week was characterised by downside testing of the 200 day moving average which provided strong support, as was the case in late May, suggesting that we should see a bounce higher in silver prices as we recover the highs of mid June and push on towards the $19.45 to $19.80 price region in due course. For this week we need to see a hold above all four moving averages and should this occur then expect to see silver prices recover the lost ground of the past 2 to 3 weeks. This week’s price action for commodities is likely to be dominated by the start of the US earnings season which will set the tone for risk appetite and in addition we have two key pieces of Chinese fundamental data: the CPI and GDP both due out on Thursday.